This might have been shown West coast/California. Public access show early 90’s Produced in Southern California, but shown on my local San Francisco public access. Mind you, I think they were trying to be funny; they’d put on these weird, twerpy cartoon voices. It didn’t work. It just had that unintentional (or maybe intentional) creepiness. It was like New Zoo Review meets Mary Hartman, Mary Hartman meets VIDEODROME. UNK SEZ: Stop the presses! This NTT has been solved by TOMB himself! 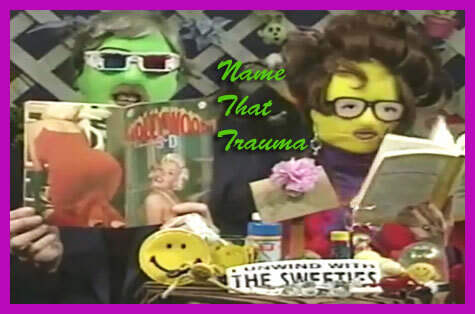 Check out Tomb’s trauma (UNWIND WITH THE SWEETIES) in the video below (at around 12:25) …if you dare.